K&M; Yachtbuilders, Satellite Yacht Design and Guido de Groot Design present the Axonite 57. 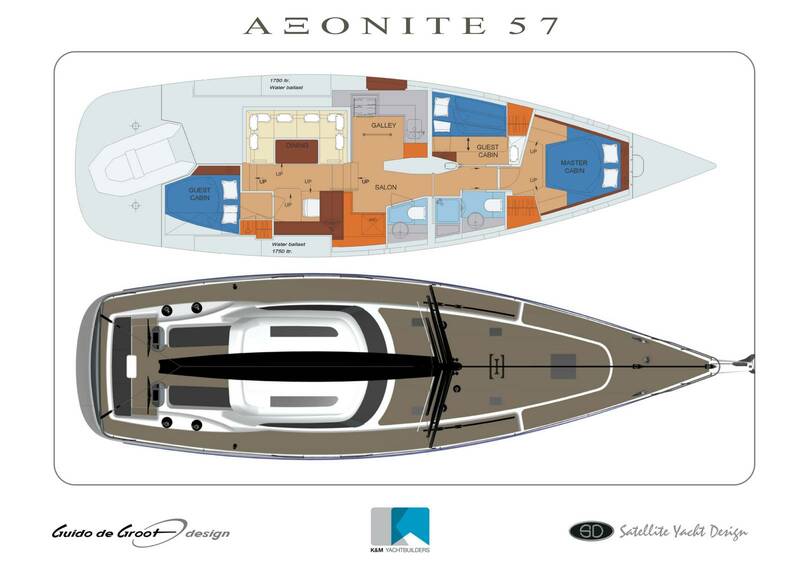 These three companies are respectively responsible for the building, design and styling of the yacht. 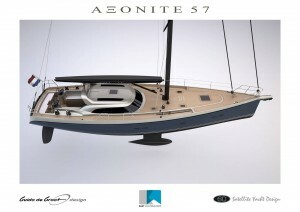 At the end of 2010, the Axonite 69 was launched in Makkum, and now the companies developed a smaller version in the line of Axonites. 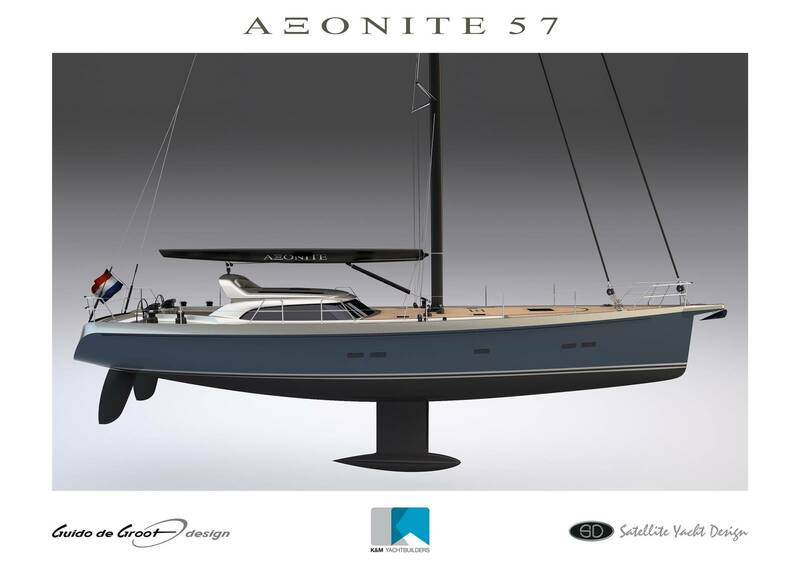 The result is a 57-footer, with the same design criteria and entirely designed in the same style like the Axonite 69. 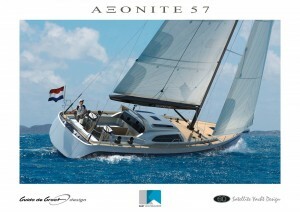 Here the focus is also on sailing and comfort. The ratio between the sail area and displacement is optimized by applying a retractable T-keel, with a variable draft of 2.90-1.40 meter and 1750 litre water ballast per side. The choice to keep the cockpit as low as possible is made so the crew can move themselves safely at sea. This is further enhanced by fastening the mainsheet on a roll bar so there is no obstacle between the deck salon and the steering position. To move safely on deck, a bulwark is created. The permanent cockpit table offers a good grip during sailing and a cozy place in the port or at Anchorage. In the deck salon is a spacious settee in U-shape and the chart table. During sailing in bad weather the deck salon, with a full view around, is a safe and comfortable place to stay. The spacious owner’s cabin is located in the fore ship. The two spacious guest cabins have a double- and a bunk bed. The U-shaped galley is located underneath the front windows of the deck salon and is light and spacious. In the fore ship is a head with separate shower and the day head is located in the deck salon. The engine room is located under the deck salon with space for the main engine, a generator, water maker and other technique. The hydraulic transom door is a wonderful bathing platform and also provides access to the dinghy storage. The Axonite 57 is also available with alternative keel versions and lay outs. 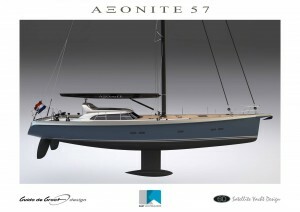 At the moment, the design team is also developing a 90 foot Axonite.